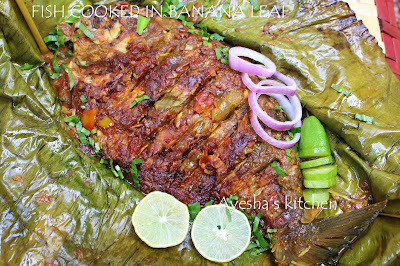 Fish wrapped in banana leaf recipes - a must try Indian fish recipes which is worth trying. This recipe is usually done with pearl spot fish (and is named as Karimeen pollichath ). Cooking with banana leaves is very popular around the world. This is because banana leaf recipes will maintain the moisture and flavor with a delicate and grassy aroma. Fish roasted in banana wrap/fish Pollichath is a mouthwatering fish recipe with a lovely yummy aroma of banana leaf. It is the typical and unique recipe of Kerala, India. The specialty of this whole fish recipe is that, once you prepare this dish you will always crave for this again. 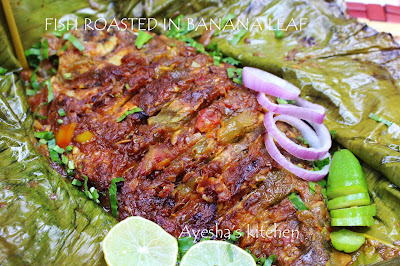 Here fish is marinated with spices and coated with a tangy gravy and then baked in banana leaf. And i used Bilimbi fruit (Irumban puli, it comes under those list of food that provides oxalic acid in food) along with tomato which gives an extra taste to the dish. Here is the recipe of how to make fish in banana wrap/fish pollichath / fish wrap recipe/banana leaf fish /the banana leaf dish. Marinate the pomfret fish with the ingredients given under marination except oil and keep refrigerated for 15 minutes. Then shallow fry both sides for 4 minutes with 2 tbsp of oil. Now in the same oil, splutter mustard seeds. Then saute cumin seeds and then saute shallots along with ginger garlic paste, green chili. Saute till shallots turn golden and the raw smell disappears. Then add chili powder, turmeric powder, and salt. Mix well. Add tomato and bilimbi fruit (soaked in hot water) now and cook till it becomes mushy. Finally, add coconut milk and coriander leaves. Mix well until it is thickened. So the gravy is ready. Now take a banana leaf and slightly heat the banana leaf. This helps to fold the leaf without breaking. Grease the leaf with some coconut oil and place half of the gravy on the leaf. Now place the half fried fish and top the remaining gravy over the fish. Now cover the leaf like a parcel and tie it carefully. Now heat a pan / tawa with 1 tsp oil over medium heat. Place the banana wrap over the pan and cook for 10 minutes. Now flip the wrap and again cook for 10 minutes. Open the parcel and serve hot the yummy flavorful fish recipe.